This slice has fast become my family’s favourite! My kids absolutely love it & often get involved in making & icing it. I tried a few recipes, some too dry, but my favourite was from a blog called Make it Perfect. I’ve tweaked the recipe a little & adjusted everything to grams, so it’s so easy to weigh the ingredients into your bowl. For an egg free version of this slice, replace the egg with 40-50g chickpea water. This is the water drained from a can of chickpeas. You won’t be able to tell the difference, in fact, I prefer it with the chickpea water. 1) Pre heat oven to 170 degrees (fan forced). 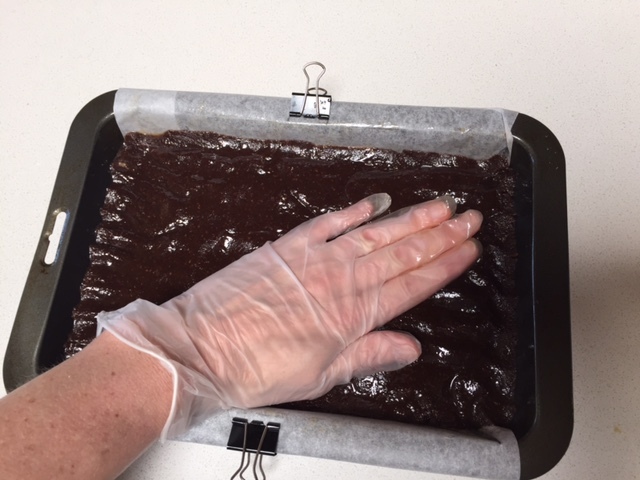 Grease & line a slice tin with baking paper. 2) Place weetbix in TM bowl, crush 5 seconds/speed 10. Set aside. 3) Without washing TM bowl, add butter, melt 3 minutes/60 degrees/speed 1. 4) Add cocoa, sugar, coconut, egg & reserved weetbix, mix 20 seconds/speed 4. 5) Scrape down the sides of the bowl, mix a further 10 seconds/speed 4. 6) Pour mixture into slice tin & press evenly into tin (see notes). 7) Bake for 20 minutes. Allow to thoroughly cool before icing. 1) Place icing sugar in TM bowl. Mill 5 seconds/speed 10. (No need to sift – it’s now done)! 2) Add cocoa & butter. Add 5-10g boiling water, then mix 10 seconds/speed 5. 3) Add 5-10g more boiling water & mix again 10 seconds/speed 5, until you achieve a smooth consistency. Don’t add more than 10g boiling water at a time, as too much & the icing will be too runny. 4) Pour icing on cooled slice & sprinkle with 100’s & 1000’s. In my kitchen, food handling gloves are a must have! For this slice, I put some on & press the slice down evenly with my hands before it goes in the oven. I cut up the whole slice into small pieces, then store half in the fridge for the kids to enjoy. The other half of the slice goes in the freezer, so I can always pop a few pieces in their lunch boxes. I made these biscuits recently & my kids devoured them. 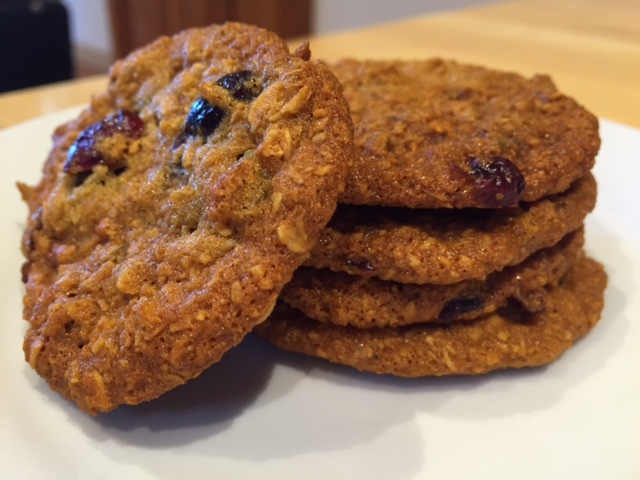 These are Anzac biscuits, with cranberries, pumpkin seeds & sunflower seeds added to them. You could really add any dried fruit or seeds, but this combination is really lovely. Lunchbox friendly & I’m sure the whole family will love them! 1) Preheat oven to 170 degrees celcius. 2) Place butter, syrup & water in TM bowl, melt 3 minutes/70 degrees/speed 2. 3) Add bi carb soda, mix 5 seconds/speed 3. 4) Add remaining ingredients, mix 10 seconds speed 3. 5) Scrape down the sides of the bowl, knead mixture on dough setting/45 seconds. 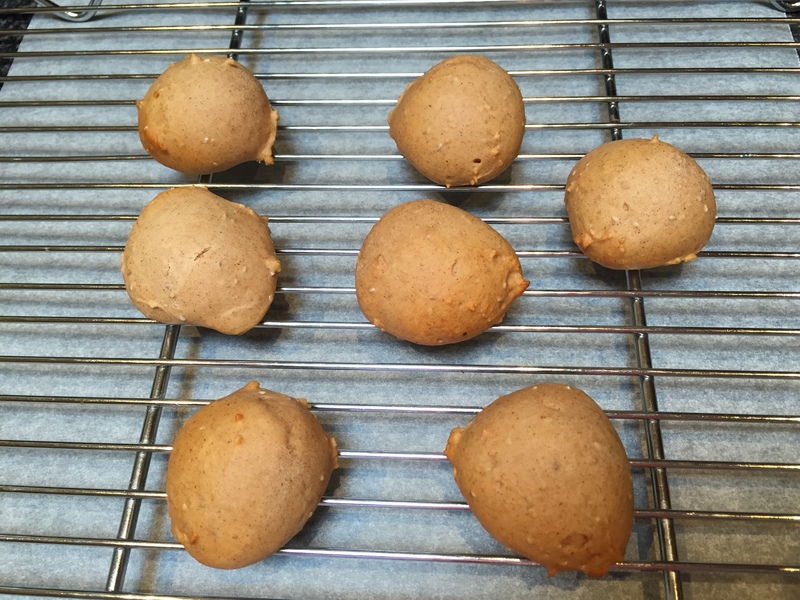 6) Place small balls of mixture on tray lined with baking paper & lightly press down each ball with a fork or spoon. 7) Bake for 12 minutes, until golden. These muffin balls are fantastic for lunchboxes! 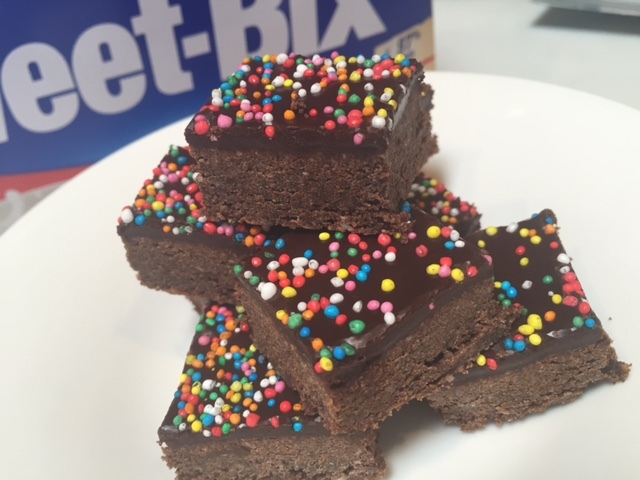 They’re also so easy to make, literally just place all ingredients into your Thermomix & mix! I love that they don’t even need to be rolled into balls with your hands. If you use an old fashioned ice cream scoop, you can scoop them straight onto the tray. They also freeze well, so you can add them to a lunchbox straight from the freezer & they’ll be ready to enjoy by recess. My 5yo loves them, which means they passed the fussy eater test! 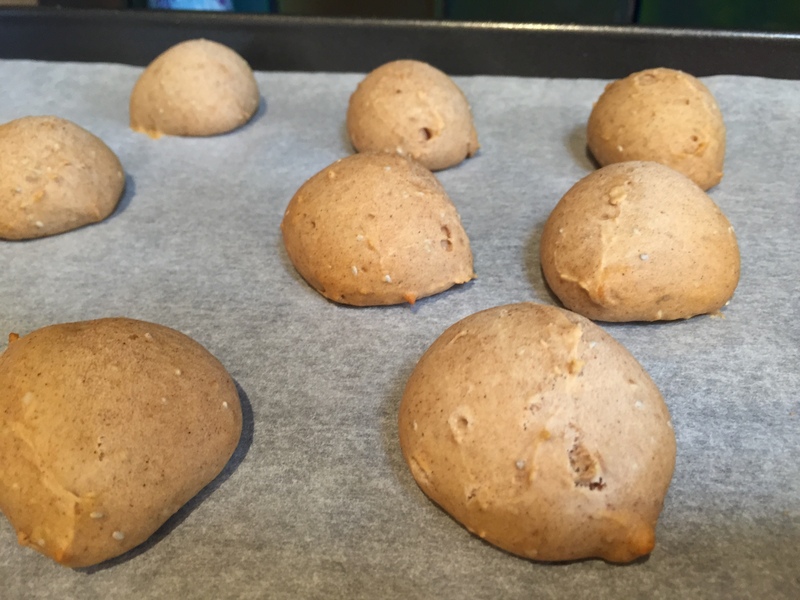 4) Using a small old fashioned ice cream scoop, scoop balls of mixture onto a tray lined with baking paper. 5) Bake 12-15 minutes, or until the balls just start turning brown. Take care using the ice cream scoop or any steel spoon in your TM bowl, as they could scratch the inside of the bowl. When it’s getting towards the end of the muffin mixture, I scrape the mixture into another bowl, just to prevent scratching. You can also place your TM bowl back & turbo a few times, to release mixture around the blades, so there’s less wastage. Substitute apple puree for apple/raspberry or apple/strawberry puree for different varieties. For a healthier option, substitute…..
Pizza Night (with lots of veggies)! It might not sound like a stretch to get your kids to like pizza, but my 5yo daughter is a very fussy, plain eater. Even to the point where she would turn up her nose at a slice of pizza, just because it was something different. Although she’s getting better, she’s still very fussy, although now she’ll try something, before telling me she doesn’t like it….. sometimes! Anyway, she now loves pizza, so that is one new thing she likes, although she can still spot the smallest vegetable in her dinner, so I’m getting very creative at hiding them. This pizza I made for dinner this week was very easy (almost everything I grabbed from the freezer), very tasty & most importantly, FULL OF VEGGIES! The sauce on this pizza is a few cubes of mashed vegetables, which I have in the freezer. Then I mix in a few teaspoons of tomato paste, to give it a pizza sauce colour. Follow this link to the veggie mash recipe. I made the beef meatballs in my Thermomix too, although I haven’t posted the recipe yet. They too are full of veggies, that are pureed so fine that my 5yo can’t spot them & then steamed in my Varoma tray. I’ve then sprinkled on some cheese & cooked. The pizza dough recipe in your basic or everyday cookbook makes 4 pizza bases. 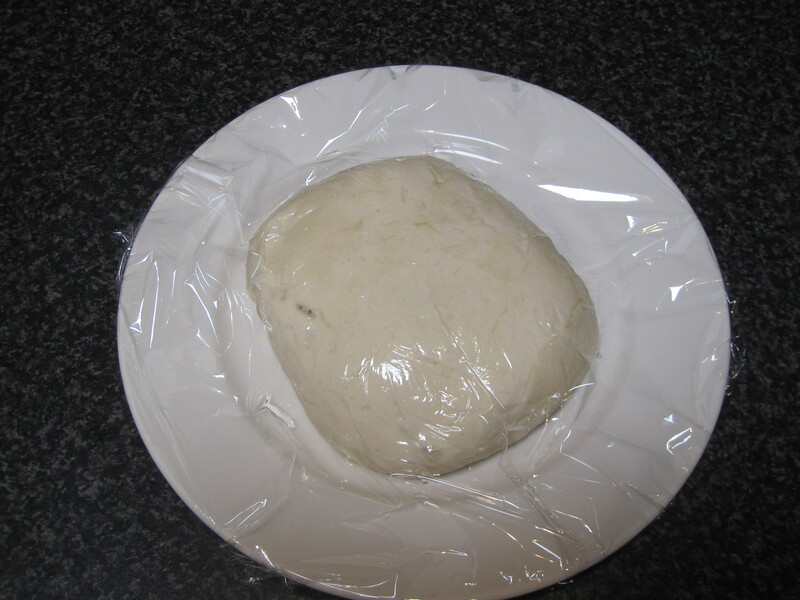 After the dough has been proved, it’s fine to freeze the dough if you’re not using the whole amount. I freeze my dough in portions, wrapped in glad wrap. 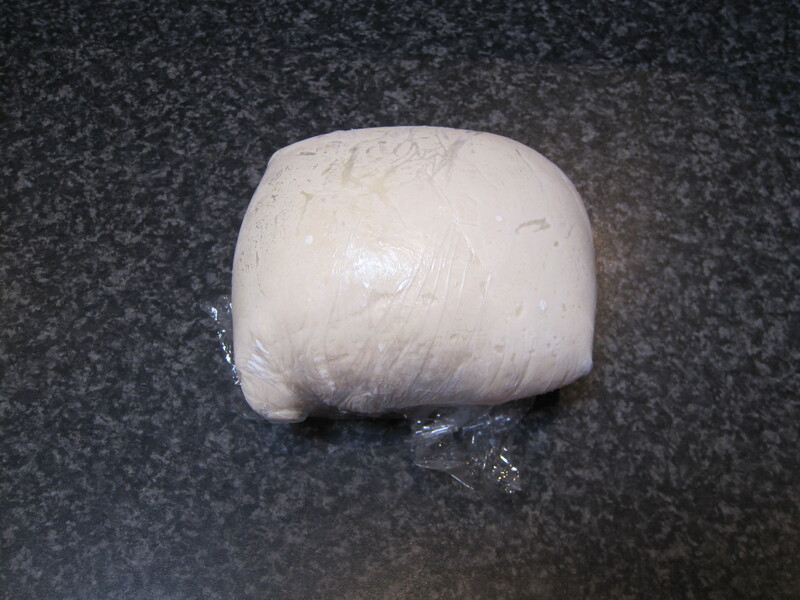 If you want to make frozen dough into a pizza, allow a few hours for it to defrost & come to room temperature. I’ll usually put mine out in the morning or at lunchtime. Unwrap the frozen dough & put on a plate. 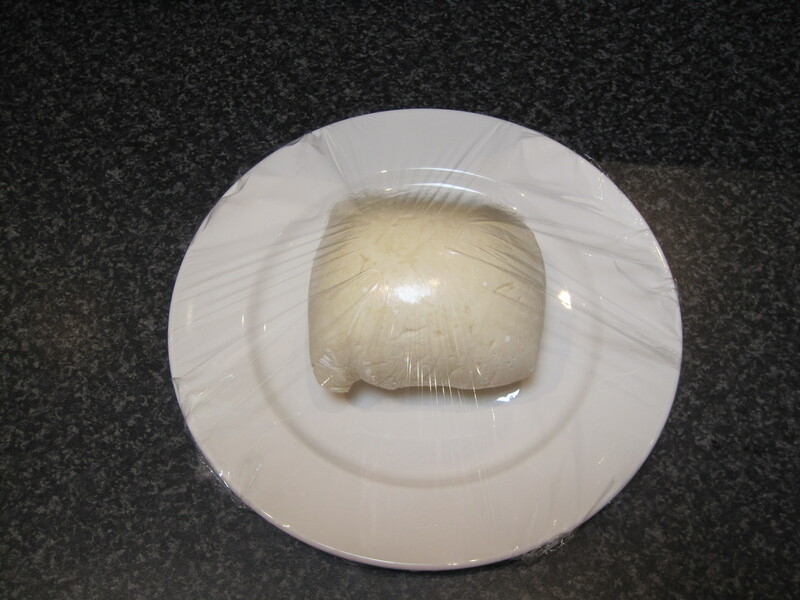 Place fresh glad wrap over the frozen dough, making sure that it’s airtight. Now just allow your dough to slowly defrost. As it comes to room temperature, it will prove again, doubling in size, which is why you place fresh glad wrap over it. 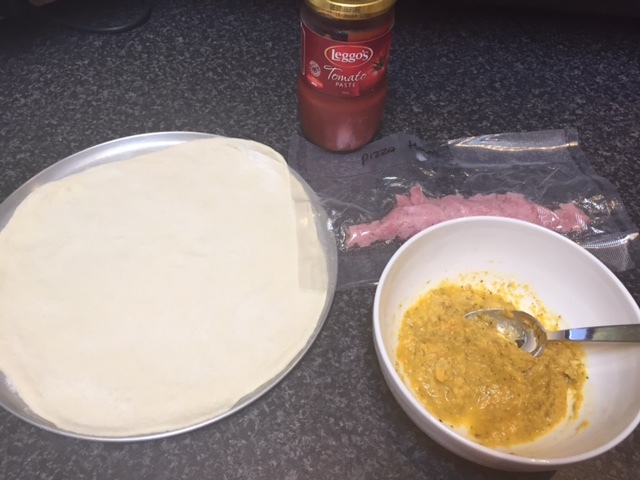 The dough will be quite sticky, so it’s good to roll out on your ThermoMat, with some plain flour on both sides of the dough. 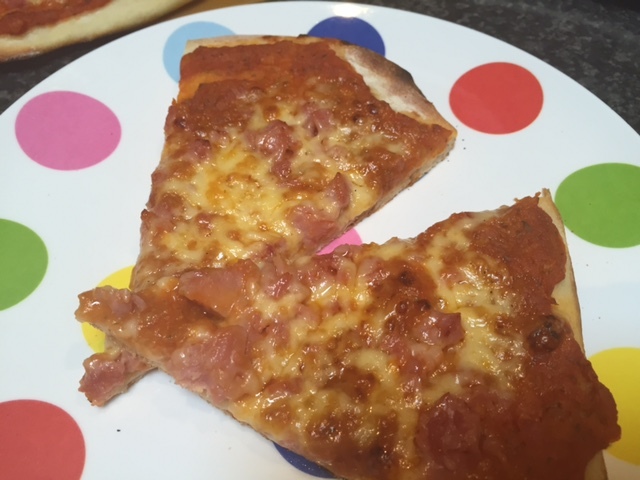 Another way to make sure you can always whip up a quick pizza for dinner (without having to go to the shops) is to have some toppings in the freezer. I recently bought a boned leg of ham at the supermarket that was on sale, shredded it in my Thermomix & then frozen in 90g portions. Not only is this convenient, it can save you a lot of money. It was my daughter’s 5th birthday yesterday, so I’ve been busy making lots of party food. My kids love honey joys, but I think my Dad loves them even more! As I was making them yesterday, I converted the 1/3 cup & tablespoon measurements from my recipe into grams, so next time I can just weigh the ingredients into my Thermomix bowl. It’s great to have the butter mixture melting at a controlled temperature & not have to keep stirring it. While it’s melting, you can get all the patty pans ready for the next step. 1) Pre heat oven to 150 degrees & line muffin tray with patty pan cases. 2) Place butter, sugar & honey in TM bowl, cook 5 minutes/100 degrees/speed 2. 3) While the butter mixture is cooking, place a mixing bowl on top of the TM lid, zero the scales & weigh cornflakes into bowl. 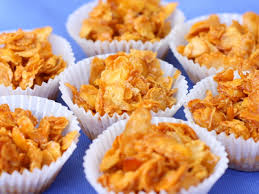 4) Pour butter mixture over the cornflakes & mix well. 5) Working quickly, spoon mixture into patty cases. Bake for 10 minutes. 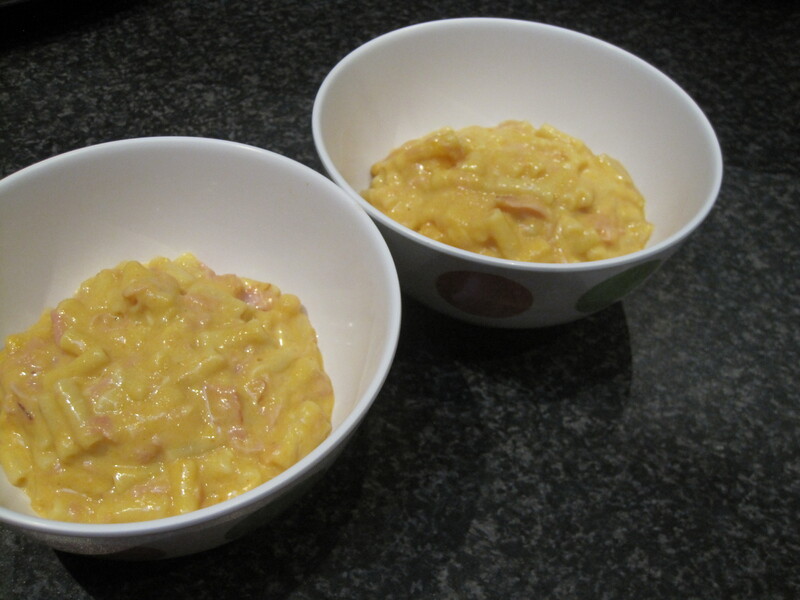 If you prefer, you can add the cornflakes to the TM bowl in steps 3 & 4. Mix the cornflakes for 15 seconds/reverse/speed 2 or until the cornflakes are all coated. I prefer to mix the cornflakes & butter mixture in a mixing bowl, as you need to use a tablespoon to spoon the mixture into the patty cases & I’d rather not use a tablespoon in my TM bowl, so I don’t scratch it. If you’d rather do everything in the Thermomix & avoid washing another mixing bowl, just take care when spooning out the last of the mixture & be careful not to scratch the base of your TM bowl. 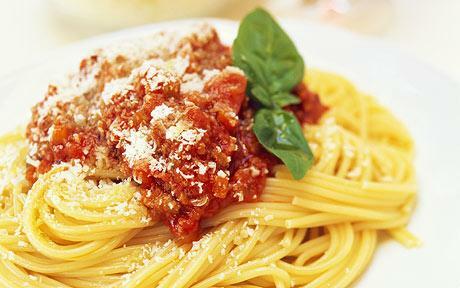 I love a good Spaghetti Bolognaise & it’s one of my kid’s favourite meals! I find it such a great sauce to have on hand in my freezer, as a go to meal when I don’t have time to cook. I’d never thought of adding this to my blog, until I realised that I’m often asked by my customers what bolognaise recipe I follow. The best thing is, this sauce is made from scratch – no additives or preservatives. You can also add any vegetables you like in step 1 & if your kids are expert veggie spotters, puree the veggies by increasing the blade speed to speed 7 (in step 1). 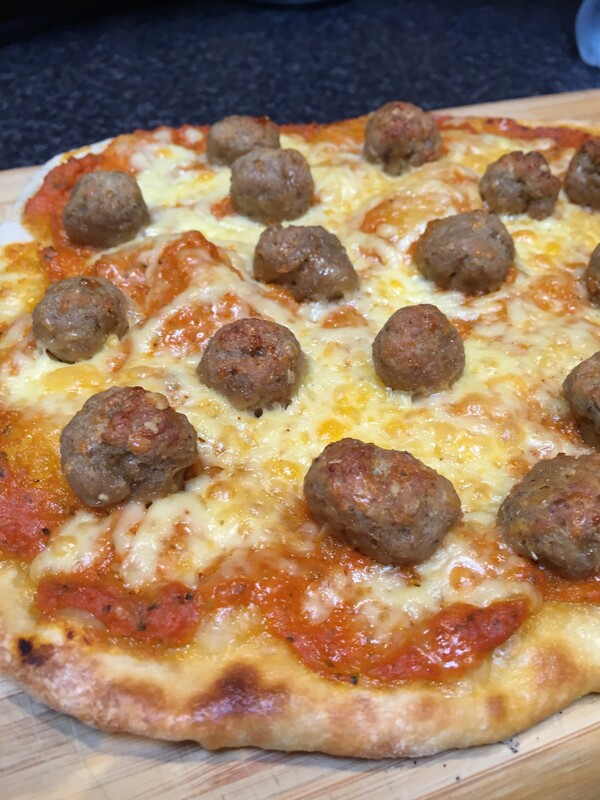 This was a Thermomix recipe that I’ve tweaked along the way, adding a few things here & there. I’m now really happy with the recipe & it’s just how I like it. It’s not a really thick sauce, as I prefer the sauce to coat all the pasta. However, if you wanted to make this thicker for a lasagne, I’d just add some more beef mince or add less tomato puree. 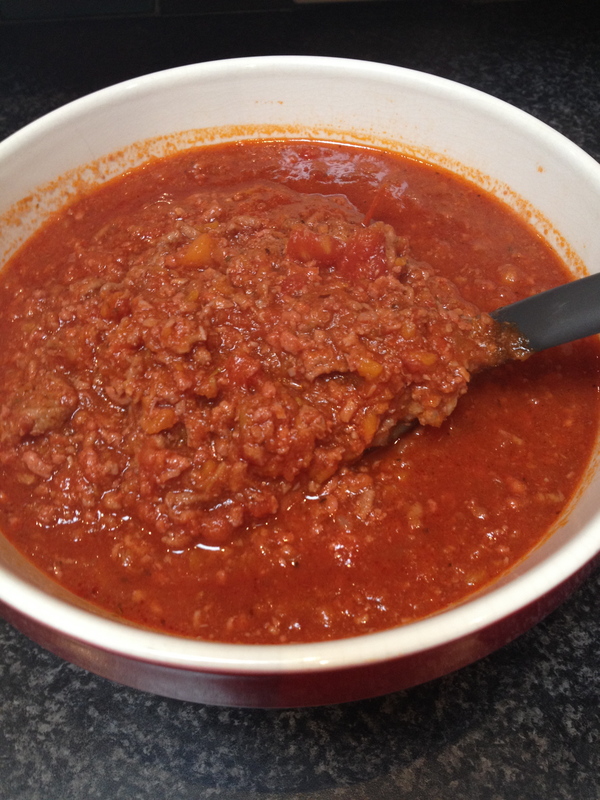 If you like, you can substitute some of the beef mince for pork or veal for more flavour. Of course, you can also make this sauce by mincing your own meat in your Thermomix, so the consistency is more like a ragu. 1) Place onion, garlic, carrot, celery & bacon in TM bowl. Chop 5 seconds/speed 5. Scrape down sides of the bowl. 2) Add oil, cook 5 mins/120 degrees/speed 1 (MC lid off). 3) Add mince & wine, cook 10 minutes/Varoma temp/reverse/soft speed. You may need to to give the mince a gentle stir with the TM spatula, if there are some pieces of mince stuck together. 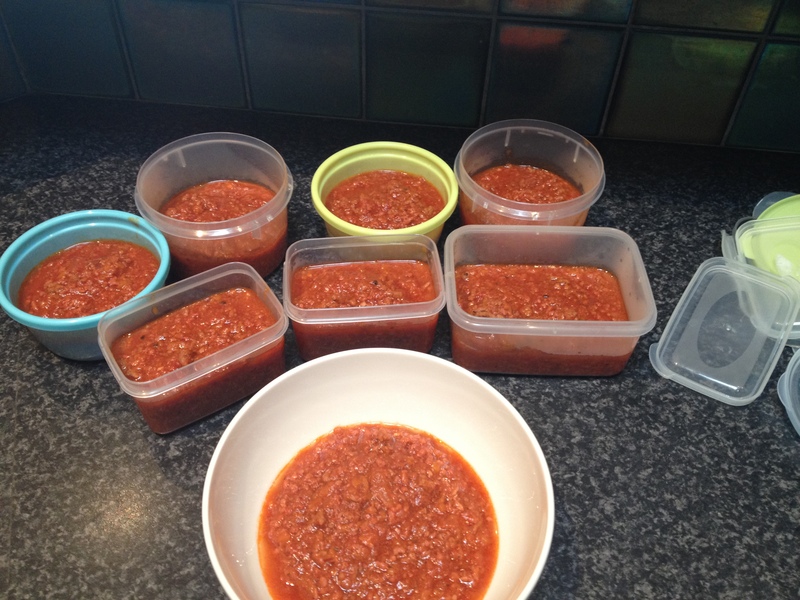 4) Add stock, tomato puree, paste, dried herbs & diced tomatoes. Cook 15 minutes/Varoma temp/reverse/soft speed. With MC off, place rice basket on top of lid to prevent splatter. Season with pepper to taste. I freeze my sauce in 2 serve portions for the kids. 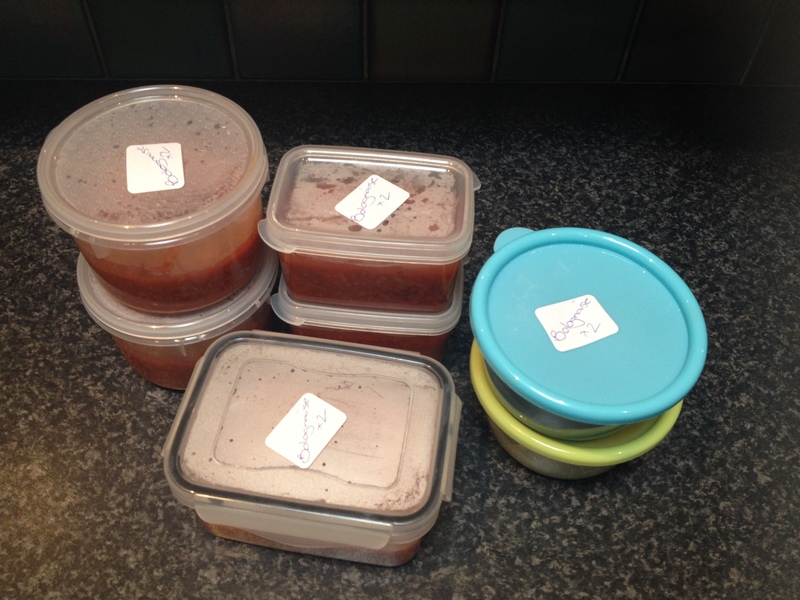 This recipe made 8 dinners for my girls – one for that night & 7 for the freezer! I found this recipe on Facebook recently & noticed the amount of positive comments from Mum’s with fussy eaters. As my 4yo is very fussy, I thought I’d have to give it a go. Well……This is really yummy & Sophie devoured it! In my household, that proves that it’s a big hit for any kids! The best thing too, as that the sauce is full of pureed vegetables & the kids would never even know it. I took some advice from the comments on the recipe & peeled the zucchini, which was recommended if you had a veggie spotter on your hands. Sound familiar? 1) Add cheeses to TM bowl, chop for 10 seconds/speed 9. Set aside. 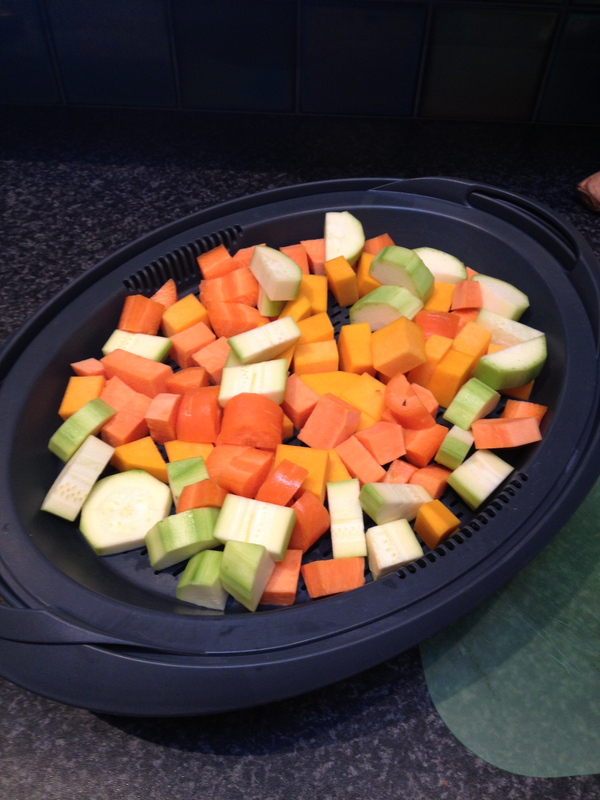 2) Peel & dice vegetables into 1-2cm cubes & put onto Varoma tray. Peel the zucchini if you have kids who can spot the ‘green bits’! 3) Place boiling water into TM bowl, add macaroni & put Varoma into place. 4) Cook 10 minutes/ Varoma temperature/Reverse/speed 1. 5) Drain macaroni & place in a Thermoserver to stay hot. 6) Add steamed vegetables to TM bowl, chop 10 seconds/speed 8. Stir veggie puree through macaroni. 7) Without cleaning TM bowl, add flour, milk & butter. Cook 6 minutes/90 degrees/speed 2. 8) Add ham, cheeses, mustard, paprika, stock concentrate & pepper. Cook 2 minutes/90 degrees/Reverse/speed 2. 9) Pour over macaroni, stir through & serve. 7) Without cleaning TM bowl, add flour, milk & butter. Cook 5 minutes/90 degrees/speed 2. 8) Add ham, cheeses, mustard, paprika, stock concentrate & pepper. Cook 1.5 minutes/90 degrees/Reverse/speed 2. Notes: You can use spelt, gluten free or any flour in the recipe. Also, use any kind of milk too.